Location: In the romantic countryside around Mondsee our organic pasture farm offers a wealth of comfort for the entire family. The spacious apartments are furnished with wooden floors or tiles and solid wood furniture, for a relaxing and healthy holiday. Surrounded by fields let your eyes rest on the magnificent mountain scenery. Very good restaurants with gardens for guests and a playground can be found within 300 m walking distance. Next door are tennis courts, an indoor tennis court, bowling alley and minigolf. 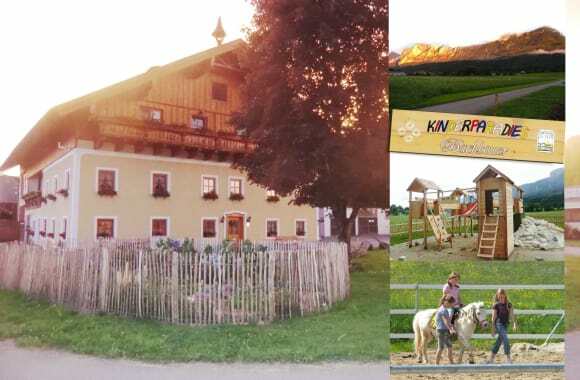 Embedded between lakes and mountains the Mondsee countryside offers numerous possibilities for your leisure time. The Mondsee lake with its water sports - swimming, boating, surfing and sailing - is only 3 km away. Your hosts are always ready to give you tips and information. Features: The 200,000 m² organic pasture farm with horse rearing provides you and your family with room to let off steam. We offer: Pony riding, table tennis, a playground, large swing, trampoline, campfire, barbecue, washing machine, forest tours - all included in the price! Horse and cart rides and gym/spa area are charged extra. Dogs, cats, goats and ponies are all waiting for you! And as the sunset lights up the Drachenwand mountains, look back on the events of the day whilst sitting on the terrace or cosily by the campfire. Location: In the romantic Mondseeland countryside our organic pasture farm provides every conceivable comfort for the entire family. The spacious apartments are almost exclusively equipped with wooden floors and tiles as well as solid wood furniture to ensure a relaxing and healthy holiday. Surrounded by meadows you can rest your eyes on the magnificent mountain scenery. 300 metres away you will find restaurants offering family-friendly dishes. Just next door there are indoor tennis courts and a skittle alley. Weather permitting, you can go cross-country skiing, take a night-time sleigh ride as well as enjoy ice skating or go on forest hikes. Mondsee lake is only 3 km away and the Christmas market in the city of culture of Salzburg (20 minutes by car) is a great starting point for taking a stroll around town. Features: The 200,000 m² organic pasture farm with horse rearing provides you and your family with room to let off steam. 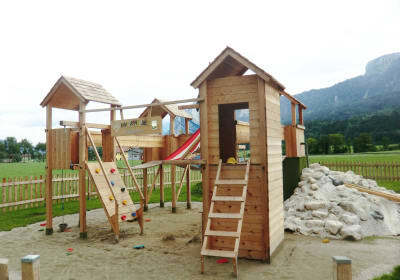 We offer: Pony riding, playground, large swing, trampoline, washing machine, forest tour - all included in the price! Carriage rides and gym/spa area (for a fee) with the healthy heat provided by the infra-red sauna. Dogs, cats and ponies all look forward to meeting you. Please enter your travel information. Unfortunately, there are no rooms or packages available for your request. Unfortunately, there are no rooms available for your request. Spacious double bedroom with bath. Sleeps a further 2 on a sofa bed. 30 m² floor space. Including desk, satellite TV and stereo system. This apartment is for 1-4 persons. It has a large balcony with a beautiful view of the forest. Kitchen including domestic appliances and crockery. Living room/bedroom with double bed (top quality). Children's room with two single beds. New wooden floors and solid wood furniture. Travel cot upon request. Approx. 48 m² in size. Bathroom completely renovated in 2010!